LOS ANGELES -- As usual, Kobe Bryant came up big when the LA Lakers opened their 2012 NBA playoffs run Sunday afteroon before a fullhouse crowd of 18,997 at the Staples Center here in dowtown Los Angeles. Bryant sizzled for 31 points as Los Angeles easily dispatched the Denver Nuggets, 103-88, to win Game 1 of their best-of-7 series. As spectacular as Kobe was, he had to share the spotlight with big man Andrew Bynum, who tore through the history pages with a playoffs performance of a lifetime. 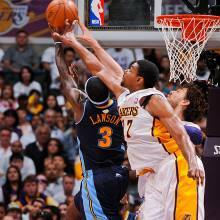 The 7-foot, 285-pound Bynum finished with 10 points, 13 rebounds and 10 blocked shots. Those ten blocks tied an NBA record shared by Mark Eaton of the Utah Jazz and all-time great Hakeem Olajuwon of the Houston Rockets. Those ten blocks also broke a 35-year old franchise record of nine blocks held by Hall-of-Fame center Kareem Abdul-Jabbar. The last Laker to register a triple-double in a playoffs game was Lakers megastar Magic Johnson, who pulled the trick in Game 5 of the 1991 NBA Finals --- 16 points, 11 rebounds and 20 assists. "Monstrous. He was an absolute beast down there," Lakers head coach said of his center's historic effort. At least one Nugget was very pleased with Bynum's effort. "We've got to find a way to score before he gets in the paint, because he's impressive, "said Denver forward Danilo Gallinari. Bynum's previous playoff game was an ugly memory. He was ejected in Game 4 of the Western Conference Finals last May when he threw a viciously malicious elbow that sent then Dallas Mavericks guard J.J. Barea crashing hard on the floor.